Regency Dinner & Dance on Saturday! 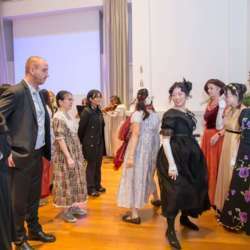 The Jane Austen Protected content Ball is coming soon, this March Protected content ! Join us for the annual evening of merriment as we celebrate Jane Austen 📓📚📖 while learning Regency 🎭💃dancing & enjoying live music🎶! Be entertained by a live dramatised reading of one of Austen's beloved novels as we dine. Dinner and entertainment are both included with the ticket. Timing is 7:30 pm to 9:30 pm, but dance lessons start at 6:30 pm.